Every school morning we hear the Panther Pride expectations explaining how to be positive, respectful, inclusive, determined and engaged. However, hearing, seeing and doing are very different things. 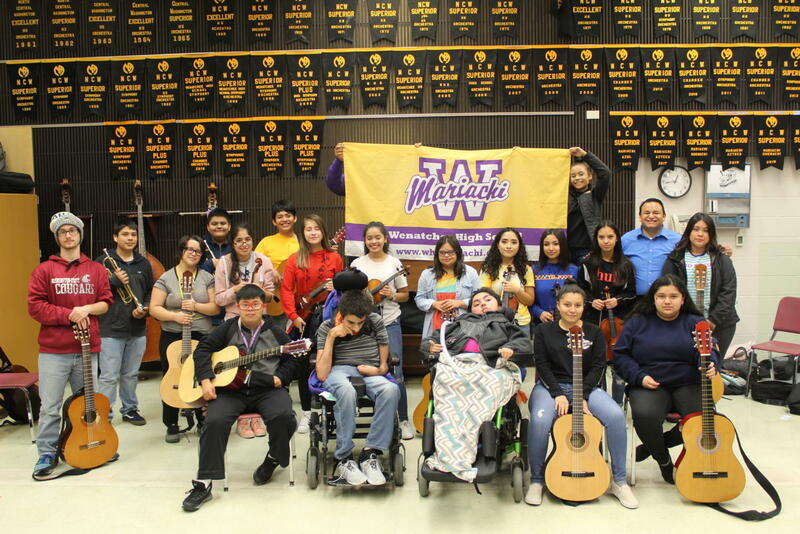 For the past years the Wenatchee High School Mariachi has allowed students with special needs to be a part of Mariachi. Students with special needs in the classroom are, sophomore Marvin Miguel, junior Angel Vega, junior Daniel George, sophomore Nadia Romero, senior Cameron Rittenhouse, freshman Isabel Martinez, Benito Amezcua, senior Jorge Gomez, senior Colton Johnson, senior Aldair Tevez. For most of the day, these students are in self-contained or special education classes, but for one period per day, they get to be part of Mariachi Huenachi. In this class, they get the opportunity to play instruments and be around other WHS students. Originally, these students would only observe the Mariachi play. However, eight years ago, mariachi instructor Ramon Rivera changed this. He decided to include these students as part of the mariachi, giving them the opportunity to perform and play an instrument. Rivera believes that it is important for these students to be around and interact with students in the general WHS population and vice versa. As a result, this class becomes a learning environment for students to learn about disabilities. For many of the students with special needs, mariachi is their favorite part of the day. The atmosphere of being in mariachi and being able to play an instrument makes these students feel like they are part of a team. “Playing guitar and singing makes me feel happy and excited in mariachi. Students are sweet, nice, and kind. I feel included,” Martinez said. Being part of a team is something that’s both inclusive and exciting for many, and it’s no different for these students. Freshman Astryd Campos, a member of mariachi along with these students, has noticed that the students with special needs are always excited to come into class. “I love working with them. They make everything happier, when we get frustrated, they are there and they make it better,” Campos said. Being around these students has allowed Campos to learn something that makes these students different from many. They hold the ability to accept everybody, not judge and to really care. Rivera believes that this class is a win-win for all students. Students with special needs are not only happy to be part of the class but also change the atmosphere of the class in general to be happy as well. “Mariachi is fun and makes me feel happy, I like the music and playing the violin. Mr. Rivera is always happy and mariachi is my favorite class,” Romero said. Dec. 7, Bella Martinez will have the opportunity to perform at the Winter Mariachi Festival. Later, in the springtime, mariachi students will also have the opportunity to march in the Apple Blossom Parade with the rest of the mariachi. “I love marching in the parade and wearing the T-shirts,” Miguel said. Students also get to be part of performances and concerts in Mariachi. For Martinez being able to perform in front of an audience is her favorite part. “When the school talks about programs for everyone, it really is for everyone,” Rivera said.